Fiber Patch Cable Packs for the more popular lengths. Available package quantities include 4, 6, 8, 10, 12 and 24 pieces per pack. Fiber Patch Cable Packs There are 10 products. Volume Discount Multi-Packs | 0.5M Singlemode LC SC Fiber Patch Cables | Pack Options: 2 Pack, 4 Pack, 6 Pack, 10 Pack, 12 Pack and 24 Pack. Save time and money by purchasing your fiber patch cables in quantity. OS2 LC to SC Duplex Jumpers, Riser Rated (OFNR), each assembled with Corning SMF 9/125 micron core/cladding optical fibers. Volume Discount Multi-Packs | 1M Singlemode LC LC Fiber Patch Cables | Pack Options: 2 Pack, 4 Pack, 6 Pack, 10 Pack, 12 Pack and 24 Pack. Save time and money by purchasing your fiber patch cables in quantity. OS2 LC to LC Duplex Jumpers, Riser Rated (OFNR), each assembled with Corning SMF 9/125 micron core/cladding optical fibers. Volume Discount Multi-Packs | 1M Singlemode LC SC Fiber Patch Cables | Pack Options: 2 Pack, 4 Pack, 6 Pack, 10 Pack, 12 Pack and 24 Pack. Save time and money by purchasing your fiber patch cables in quantity. 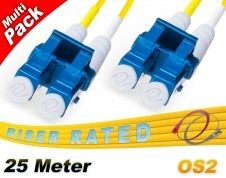 OS2 LC to SC Duplex Jumpers, Riser Rated (OFNR), each assembled with Corning SMF 9/125 micron core/cladding optical fibers. Volume Discount Multi-Packs | 2M Singlemode LC LC Fiber Patch Cables | Pack Options: 2 Pack, 4 Pack, 6 Pack, 10 Pack, 12 Pack and 24 Pack. Save time and money by purchasing your fiber patch cables in quantity. OS2 LC to LC Duplex Jumpers, Riser Rated (OFNR), each assembled with Corning SMF 9/125 micron core/cladding optical fibers. Volume Discount Multi-Packs | 3M Singlemode LC SC Fiber Patch Cables | Pack Options: 2 Pack, 4 Pack, 6 Pack, 10 Pack, 12 Pack and 24 Pack. Save time and money by purchasing your fiber patch cables in quantity. 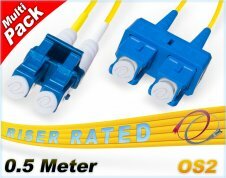 OS2 LC to SC Duplex Jumpers, Riser Rated (OFNR), each assembled with Corning SMF 9/125 micron core/cladding optical fibers.